It’s a chart comic! I think everyone knows what’s coming next! GRAPH comics! But yes, this is how Locke’s DnD character solves his problems. It’s actually quite effective, for the most part. He hasn’t punched anyone TOO important thus far. This entry was posted on Friday, March 11th, 2011 at 12:00 am and is filed under Comics. You can follow any responses to this entry through the RSS 2.0 feed. Both comments and pings are currently closed. OMG Yes! I love flowcharts! Captain Atka: the scaly face of pragmatism. I think your avatar wins. Thanks. Its the best moment of the entire series. Sounds like me and my friends, except replace “Have a pint and shrug” with “Injure my character in some way” The lastest occurrence of this was entering into a dark, creeping corridor, to which i was shoved down 20ft of stairs and landed face first into a pool of water, 30ft deep, where i somehow managed to walk on water with my skill check to swim to the surface. My falling forced awake an acidic slime who preceded to disintigrate my armor and skin. It happens a lot, and im the only tank we have being that our other tank has been on AFK from our weekly runs for a month now. The good news is, as a Battlemind, i take reduced damage from all sources, so i dont die easily. 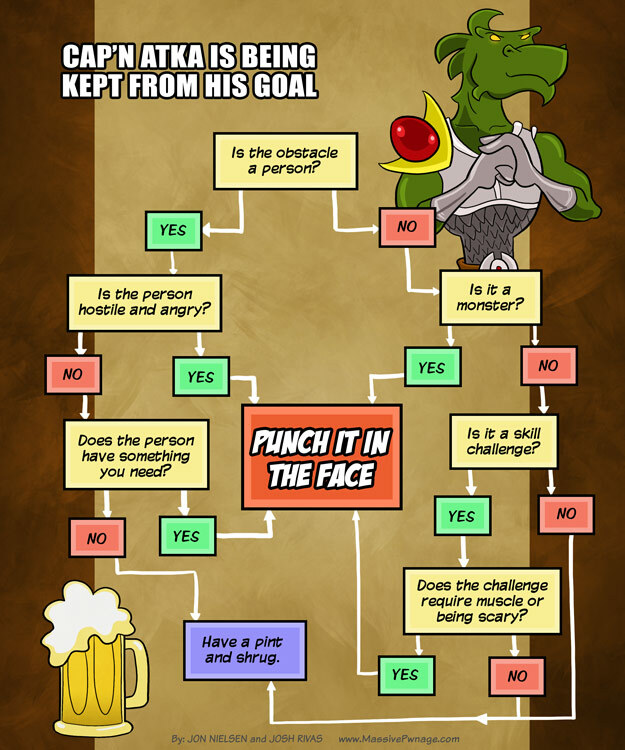 Replace “Punch it in the Face!” with “Summon my skeleton!” And you’d have my sis’s Necromancer. Hey, the picture looks familiar! i might try that with a friend i know, see how far we can get.